My latest PSDR skin for my Flex 5000A. This would look right at home in the batcave! Thanks to Bob, W1AEX for a great online tutorial and some great PSDR skins! This skin is primarily composed of Bob’s “Dark Metal” skin. 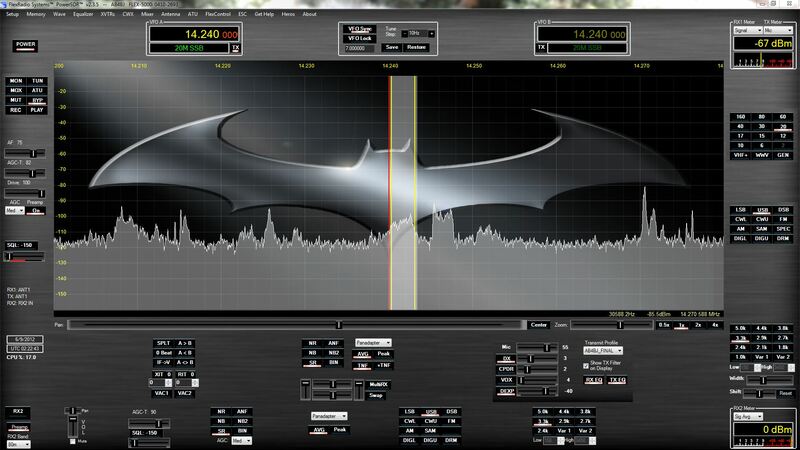 This entry was posted in Uncategorized and tagged Flex 5000, Flex Radio, Power SDR, PSDR, PSDR Skins. Bookmark the permalink. Within each of the skins folders that are installed is a subfolder named “Console” in which all the files for a particular skin are stored. You need to create a folder in the Skins directory and label it with the intended name of your custom skin. When you have done that, create a subfolder named “Console” under your custom folder. In the file structure screenshot below, I have created a folder named W1AEX AL82 and a subfolder named Console that will be the destination for all 378 graphics files in the next step. The Console panel files for this particular skin were made by taking a photograph of the front panel of my AL-82 amplifier and then importing the color of that front panel into the 10 console panel files that fill in the front of the Power SDR GUI. The panel for the background of the panadapter was lightened slightly to make it stand out a bit from the dark console. This is a very simple “flat” skin with no texturing in the panels, but it’s a perfect way to start out.